I love road trips, but I know from experience that traveling with kids poses some interesting challenges. As a military family we have criss-crossed the country numerous times. We have also driven all over Turkey, Jordan, Syria, Egypt, Tunisia, Israel, the United Arab Emirates, and Oman, logging between 2,500 and 5,000 kilometers in each location (usually in only a week’s time). Along the way we’ve learned a few tricks to make the journey a little easier on everyone. 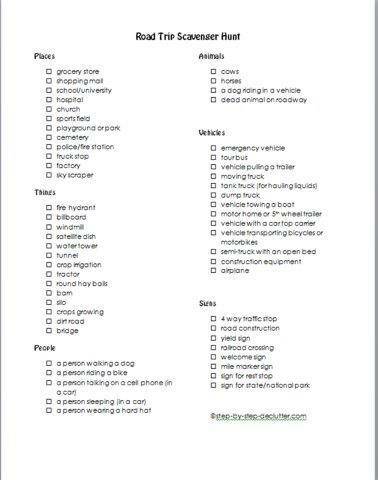 I hope you’ll find them useful on your next road trip and beyond. Perhaps the most important thing you can do to help your kids become good travelers is to travel with them. We all learn by doing. My kids were great travelers growing up, but it wasn’t because they were somehow different than other kids. It’s because they traveled…a lot. When traveling without kids, my husband and I tend to be utilitarian in our stops. We buy gas and food and use the rest room as needed, and in the process we sometimes take a few minutes to stretch our legs. Traveling with kids requires a more laid back approach. Plan to stop every hour and a half to two hours and allow yourself 20 minutes at each stop. Admittedly, stopping with this degree of frequency will take some mental adjustment for those adults who are programmed to get from point A to point B as quickly as possible. Just remember it may take you longer to get where you are going, but you will arrive with your sanity intact. What’s more, you will probably enjoy the journey more along the way. A Z Buck from roadtripamerica.com has put together an extensive list of Rest Stops and Attractions Along all US Interstate Highways. The list mostly includes parks and nature preserves, all within easy distance of the highway. Plan on spending 3-5 minutes at each stop rearranging the car which will quickly take on the appearance of a rat’s nest if the children’s natural inclinations to drop stuff are left unchecked. Throw away trash and put unused toys back in the bag or backpack from which they came. Also use this time to get out fresh snacks (if needed), load a new disc in the DVD player, and find any items that have slipped down between or under seats. By investing the time at each stop, you will save yourself a lot of effort at the end of the day when you are both physically and emotionally tired. Pillows and blankets are bulky and take up a lot of space, but they are an absolute necessity when traveling with kids. If you want your kids to nap in the car (and you do! ), then you should do everything in your power to make them comfortable. The good news is these items are quite malleable. When not in use they squish well, so you can stuff them in open spaces with relative ease. whichever parent was driving seemed happier and more at ease, while the parent in the passenger’s seat tended to be more irritable. We quickly realized the reason for this distinction: the parent in the passenger’s seat was dealing with the kids. Even when the kids were getting along well and not complaining, they were making demands. Can I have a drink? Can I have a snack? I can’t find my…Children are notorious for their timing. It wasn’t just that one kid wanted a snack. Each kid wanted a snack, but they never wanted them at the same time. They had an uncanny knack for spacing out their requests so that the passenger seat parent rarely got a break. ​When traveling with kids, switching out drivers gives both the driver and the passenger a break. When traveling as a couple there is something romantic and carefree about driving until you find a place you want to stop and then getting a room. When traveling with kids romantic and carefree are a threat to your sanity. Always make reservations in advance for places you want to stay. Standard chain hotels are your best bet because you know what to expect, and you can generally expect to find everything you will need to be comfortable. When our three oldest children were 5, 3 and 13 months we set out on a cross-country journey from Texas to Washington State. We had a reservation to camp at Mesa Verde, but when we got there, it was 30 degrees (It was 90 degrees in Texas when we left). Neither of us liked the idea of camping in sub-freezing temperatures with small children, so we cancelled our reservation, thinking we’d find a hotel room instead. The problem was, we hadn’t secured another form of accommodation before cancelling our reservation and, oh by the way, it was Memorial Day weekend. Search as we might, we could not find a hotel, motel, or campground for the next 200 miles that had a vacancy. So we drove until we couldn’t drive anymore and then we slept in the car for a few hours at a rest stop. Our 13 month old ended up being sick that night. I attempted to sleep with him lying on my chest. When I’d start to feel him heave, I’d sit up and open the car door and hold him out so he would throw up on the ground and not on me. It was probably the most miserable night of my life. Since then, we never travel without a reservation, and when our plans change, we make sure we have another reservation before we cancel the first one. Some of our family’s fondest memories are of silly experiences we had while traveling together in the car. Driving long distances affords you a unique opportunity as a parent to be with your kids. Use the time wisely to talk together, laugh together ,and share with one another. I know there is a lot to be said for just keeping kids content and quiet on a road trip (believe me! ), and I know that kids are often resistant to parental attempts to engage them in conversation. That said, if you drive far enough there will be plenty of time for you to interact with one another and for kids to withdraw into their smart phones. We have always loved reading aloud together as a family. We have read many chapter books over the years, and they have proven to be a great way to pass the time while traveling in the car. Kids can color, play with toys or even play video games while they listen. Here are a few of our family’s favorite stories* to share, each of which is appropriate for varying age levels. Car games are an old standby when traveling with kids. We have found that some are more entertaining than others. In addition, some games are dependent on the surrounding scenery – no offense to Wyoming, but it’s a bad place to play the alphabet game. ​Here are some of our favorite car games according to age. Scavenger Hunt: For younger children scavenger hunts are my favorite. You can print the free printable provided below or make your own. 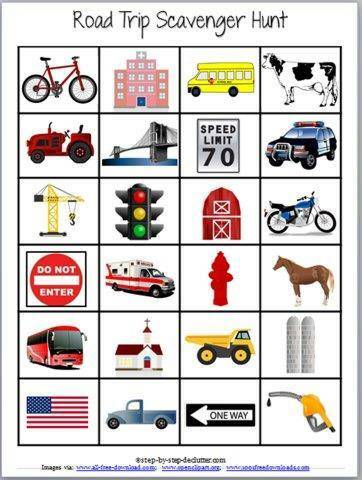 Simply come up with a list of items you expect to see on your journey (cow, tree, gas station, road sign, semi-truck, etc.) and have the children search for those items. Use pictures to depict the items for non-readers. You might even offer a small reward to the first child to find all the items on the list – like getting to choose where you stop for dinner. I Spy: This is an old favorite and requires zero preparation. One person says “I spy something blue and shiny” (car) or “I spy something tall and round and made of metal” (silo). Others in the car try to guess what the speaker sees. The Alphabet Game: The goal of this game is to identify each letter of the alphabet in order using signs and billboards. Different families play by different rules. You can decide if the letter has to be at the beginning of the word to count or if multiple letters can be taken from the same word. The most common license plate game involves finding license plates from as many different states as you can. I recommend printing up a map of the United States and having kids color in the state when they find it on a plate. Another version of this game involves finding the letters of the alphabet in order using only license plates. Only one letter from each plate can be used, and once a letter is called from a particular plate, that plate cannot be used by another player. Yet another version of the license plate game involves addition. The goal is to be the first person to add up the digits on a given license plate correctly. The Minister’s Cat: We got the idea for this game from watching the Patrick Stewart version of "A Christmas Carol" and then we made up our own rules. The goal is to come up with as many adjectives for describing the minister’s cat as possible. The trick is you have to do it in alphabetical order. The first person starts by saying “The minister’s cat is a…” The person then fills in the blank using an adjective that starts with ‘A’ such as angry or amber or amazing. We have played it a couple of different ways. In one version each player has to pick a word that begins with a different (consecutive) letter of the alphabet. For instance, player one might say “The minister’s cat is an auspicious cat”, and then player two could say “The minister’s cat is a beautiful cat”, and so on in alphabetical order. In the other version we come up with as many adjectives beginning with the same letter as we can before proceeding to the next letter. Play stops when no one can come up with a word to describe the cat that begins with the correct letter. The Geography Game: This game we learned from one of my oldest son’s friends. It also utilizes the alphabet, but with a fun twist. The first person begins by stating the name of a place. It can be a city, state, country, river, mountain, etc. It just has to be geographic in nature – something you would find on a map. The next player has to name a geographic location that begins with the last letter of the previous word. For instance, if player one says “Albuquerque”, then player two has to come up with a place that starts with the letter ‘E’ such as “Ecuador”. In this example, player three would then come up with a place that starts with ‘R’, and so on. One thing we have learned from playing this game is that a lot of place names end in ‘A’. As the game goes on it becomes more and more challenging to come up with a place that begins with ‘A’. ​Quiz Games: You can find fun quiz books for kids of all ages, or you can make up your own questions. Our kids loved taking turns answering questions. Whichever parent is asking questions just has to be sure to choose an age appropriate question for each child. You can purchase quiz books for this purpose or just bring along the question cards from a trivia game you have at home and take turns answering. 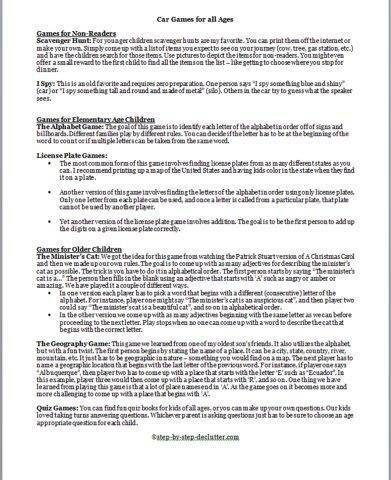 This entire list of car game ideas is available as a PDF download below. Print it up and take it with you on your next family road trip. 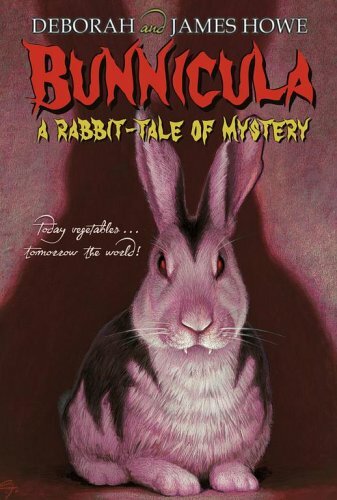 In addition, there are separate scavenger hunts to download for both readers and non-readers. Whatever the age of your children there are few things as fun as the whole family singing along to a favorite song. If you have teenagers, this is a great opportunity to hear what they are listening to. Ask them what they like about their favorite artists and songs. If your family can't agree on what to listen to try creating a mixed playlist with some of everybody's favorite songs included. Some kids will have very little interest in this activity, but others will take to it enthusiastically. If you have a child who needs to know what is going on and what will happen when, give that child a map. It will help the child feel like he/she is in on the plan. If you have a child who likes to feel involved, get that kid plotting. It will make him/her feel important, and he/she will learn something in the process..
Road trips are a great way to make lasting memories with your kids. It's a time to be together without distractions. It's a chance to talk to your children and to listen to what they have to say. I hope you've found these tips for traveling with kids useful, and I wish you a pleasantly memorable family road trip. If you liked this page, please consider sharing it on social media. Please leave me a quick comment as well in the section below. I'd love to hear from you!